In the beginning of April, 2013 Rentapen Inc. launched new website pages for their line of clamp risers and spacers. The clamp risers are made specifically for different brands of clamps including: Wolverine, Carr Lane, REID, De-Sta-Co, TE-CO, All American, and Jergens. Each riser or spacer is tapped and drilled for mounting the designated clamp and uses counter bored holes for mounting the riser or spacer to the fixture or jig. Rentapen’s design team has been designing and building weld fixtures for over 35 years. They realized they were designing the same clamp risers over and over again. So Rentapen developed what is now called RAPid Risers™, a line of tooling components that hold all of the finest brands of part holding clamps. These standardized yet versatile risers save manufacturers time and money when it comes to the design and build process. 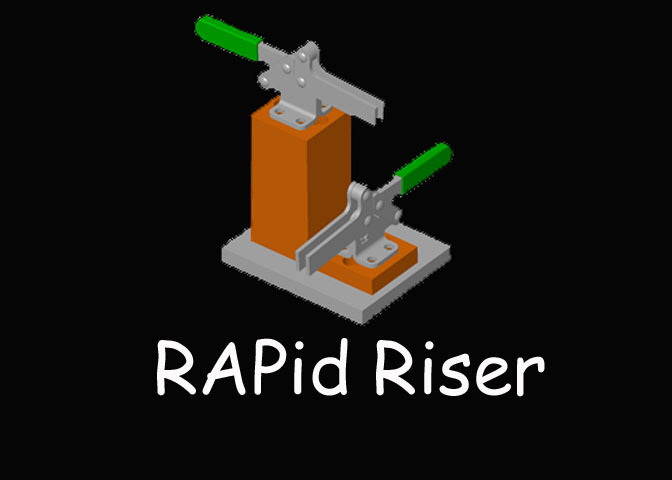 3D CAD Models of the risers can be downloaded from Rentapen’s website along with informational PDFs that detail the design of the RAPid Riser™. 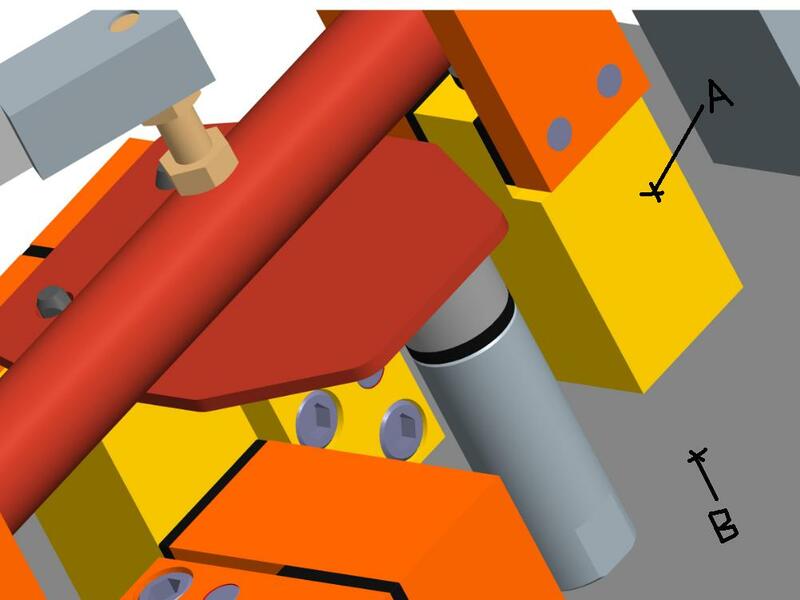 If a designer created a clamp riser from scratch, like Rentapen and all other machine tooling design companies used to do, they would have to go through a timely and expensive process that includes: designing the part; detailing; checking; ordering material; writing the CNC code; creating the part and finally inspecting the part. This entire process takes about 77 minutes. Manufacturers are now able to download the 3D model from Rentapen’s website, save the model to their library, put the riser into their design, and order the block. 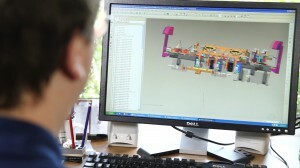 Once the model is in the company’s CAD library, the process approximately takes 4 minutes. Rentapen’s RAPid Riser™ is saving the manufacturers as much as 73 minutes in design and build time. 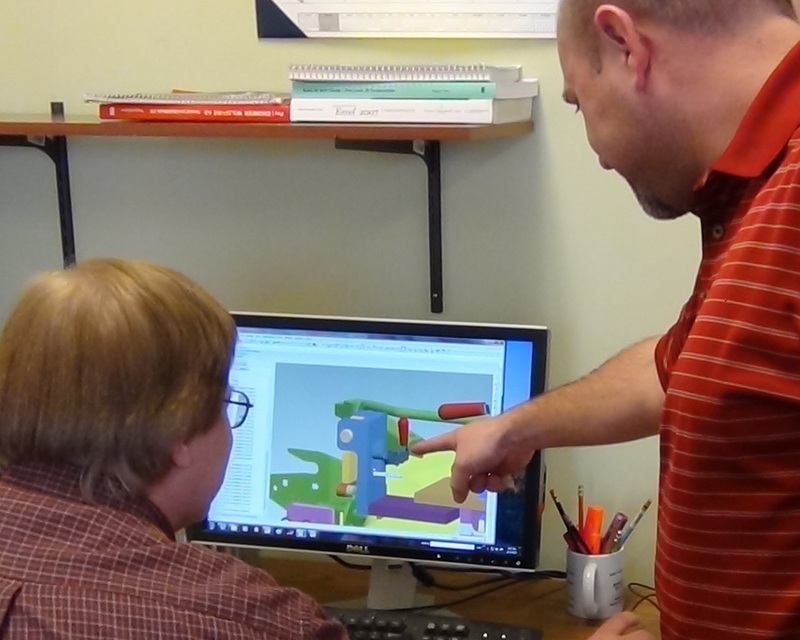 3D Models of Tooling Components Assists in Growth of Weld Fixture Design Company As New Part-Holding Tooling Pieces are Added. Rentapen Inc., of Waukesha, WI, Continues to Expand the Number of Components and Product Parts Available for 3D-Model Download. 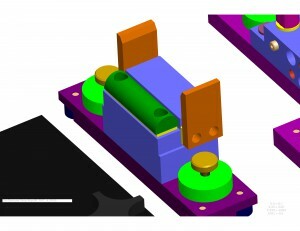 In January and March 2013, Rentapen Inc., a 3D CAD Design Company added several new components to its 3D-Model download web page, www.WeldFixtureComponents.com. Rentapen Inc., offers a large custom line of RAPid Tooling Components™ that can be downloaded for free to help manufactures save time and money while designing and building their weld and assembly jigs and fixtures. RAPid Tooling Components™ are a new American standard for the machine design Industry. 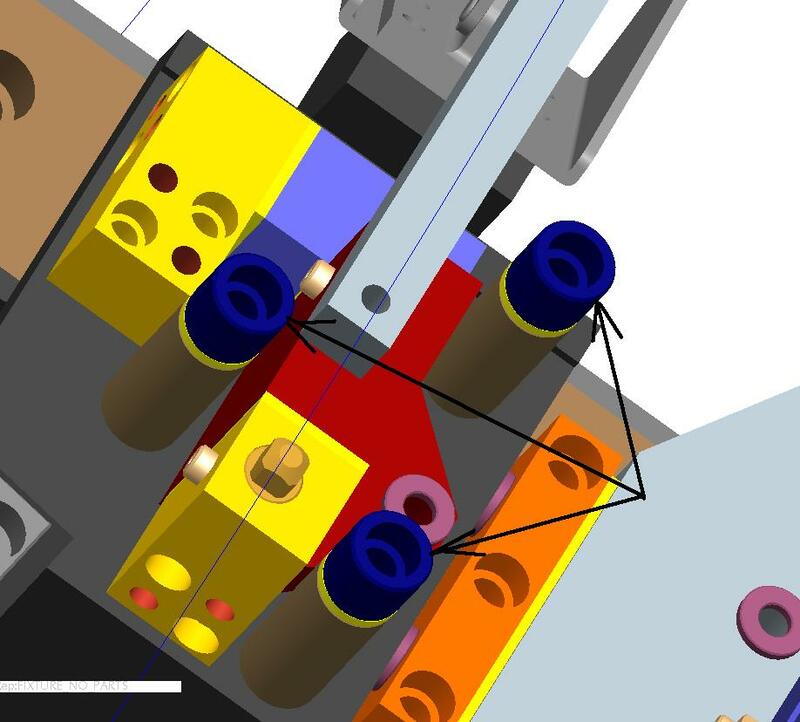 An alternative to NAAMS, Rentapen’s components along with the 3D models have changed how Machine Design Engineers and CAD Drafters design their weld fixtures. “In 2001 we discovered we, as weld fixture and assembly fixture designers, were designing the same parts over and over again. So we realized if we standardized on those parts we could save our customers lots of time and costs. So we created RAPid Tooling Components™,” said George Straley, Founder of Rentapen. Rentapen Inc., has a total of 9 different types of RAPid Blocks™ that can be ordered to fit different tooling fixture needs. 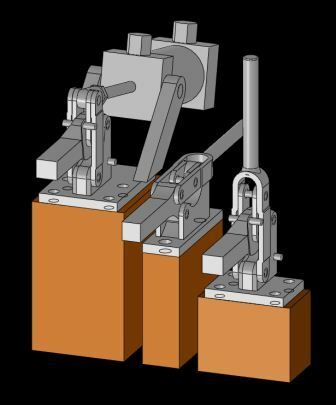 In the beginning, customers would buy the RAPid Block™ and then if the block needed to be altered, they would place the part in their CNC or take it to another vendor. RAPid Blocks are often altered to add a hole in it to hold a locating pin or a rest pad or to chamfer a corner. In 2011, Rentapen Inc., began to offer customized alterations to their RAPid Blocks™. Rentapen Inc., manufactures each block as it is ordered. This allows them to keep inventory low and provide a valuable service to their customers. Rentapen Inc., will customize the RAPid Block™ per the customer’s specifications. “Need a chamfer? No Problem. Need a hole for a locating pin? No problem,” said Susan Straley, President of Rentapen. All of Rentapen’s RAPid Tooling Components™ are made in the U.S.A. This is in line with Rentapen’s vision as the U.S. Leader in machine design and tooling components. Rentapen is dedicated to reducing costs for manufacturers. And their free 3D service is greatly help manufacturers on their lean journey. 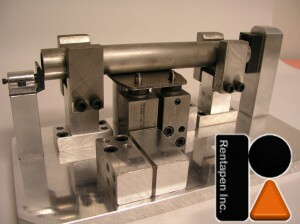 Rentapen Inc., is the weld fixture specialist, and is home of RAPid Tooling Component™s. Rentapen Inc. has been providing machine tool design services to manufactures since 1976. A Certified Woman Owned Business and owns RAPid Tooling Components™. For more information Rentapen Inc., please call 262-542-8891 or visit http://www.rentapen.com. Discover How Sub Assemblies Save a Ton of Time and Money in Machine Design. Sub Assemblies in machine design are fun and easy and the really help save time and money in a lot of ways. Once you learn how to use them efficiently you will see all kinds of places that they can be used. Then, you can be the CAD wizard at your company! A sub assembly is just a 3D CAD Assembly that is inserted into the Main 3D CAD Assembly in machine design. If that sentence doesn’t make sense, keep reading and watch the video below to get a good idea of how Sub Assemblies are super tools for Machine Designers. For example these Jergens Jig Feet along with RAPid Shims and manufactured risers are used several times in a fixture. As sub-assemblies they save time, and unclutter the assembly drawing. 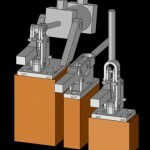 This configuration of RAPid Blocks and RAPid Shims is used in several places on a weld fixture. Only the pin changes. So this configuration, without the pin, is a good candidate for a sub assembly. It will save engineering time to create it once in a Sub Assembly and then insert the Sub Assembly into the Main Assembly several times. This goal post is part of a change over fixture. A change over means that more than one product is welded within this fixture. To “change over” the fixture to hold a different product, one sub assembly can be removed, and another sub assembly (or cover plate) can be put in its place. In a fixture with lots of parts, it is easier for the machine assemblers to read the assembly drawing and assemble a machine when the drawing is less cluttered. 1) The Machine Assemblers will love it! The drawings are easier to read. There are less Balloons on the Main Assembly Drawing. 2) It is easier to job out parts of the fixture to be made by contractors or machine shops. 3) If sub assemblies are contracted out to be made, more people can be working to create the machine at the same time, moving the machine into production faster. 4) Faster CAD design because the same sub assembly can be inserted several times into the main assembly. 5) Assembly model checking time is reduced because each sub assembly only has to be checked once. 6) The MAIN BOM can contain all the parts for the whole machine, just like always. It depends on your numbering system. All parts in a sub assembly get normal part numbers. Even the sub assembly gets a normal part number. If a 3/8” jam nut is part 103, you can use part 103 inside a sub assembly and also elsewhere in the main assembly and it won’t be a problem. The main Bill of Material will reflect the total quantity of parts both inside and outside the sub assembly. And the Sub Assembly Bill of Material will contain only the quantity of part number 103 used in the Sub Assembly. We find it helpful to use the words “sub assembly” in the name or description of the sub assemblies. That way they are easy to identify in the BOMs. Your company may use a special group of numbers for your sub assemblies. So the instructions for flattening the Bill of Materials for the purpose of ballooning only those parts not included in the sub assembly is as follows. Be sure to sign up to receive Education and Updates! All people who sign up in April 2012 will receive RENTAPEN’s DOWEL HOLE GUIDE. Give me a Recommendation on Linked in! Leave a comment below… tell me, do you use sub assemblies? Why or why not? When do YOU Drive or Not Drive Holes in Machine Design? When designing a fixture it is very helpful to drive the hole in part B by using the axis of a hole in part A that is fastened to part B. And when is “Un-driving” that hole a good idea? When should holes be “un-driven”? There are two times that I can think of right off the bat where a driven hole should be un-driven. I mean “un-driven” so that the hole in Part B is no longer dependent on Part A. 1) The machine is already built and you are making revisions. 2) The customer requests that holes be independent of any other parts in the assembly. In revisions to a machine that is already built, it is important that the CAD Drafter keep the existing holes in the same locations. This reflects reality and if there are future revisions to the machine, the designer knows where the existing holes are. Sometimes it turns out that those existing holes can be used in the new revision, saving machining time and costs. But certainly the designer needs to know where existing holes are so that they don’t design in a hole that overlaps an existing hole. When making a revision to an existing machine, if I am going to delete Part A (the driving part), I “hard-code” or “un-drive” the hole in part B first. In this video I show how I drive and un-drive holes in Wildfire 4.0. Please keep in mind that Rentapen has customized the process of making holes in Pro/E. This means that your screen and hole making steps may be different than what you see in this video. Besides revisions, some Customers can often request that holes not be driven. They might have had a bad experience in the past or with a different program. In really large machine designs, the large number of driven holes can slow the CAD program down. I feel it is a risk to not drive the holes. If the holes are not driven and a CAD Designer makes a change to a CAD design, for example: The Designer moves Part B but forgets to move the holes in the Part A. The result is a costly and time-consuming mistake. We all know that humans are not perfect and even we CAD Drafters and Designers make mistakes sometimes. Even if the CAD Designer remembers to move the corresponding mounting holes in Part A, if there is a typing mistake, the holes won’t match up. Though we can hope that the person checking the changes would catch the error, it is better to make sure the mistake doesn’t happen in the first place. Single Fastener Parts, do you drive the hole or insert the part? Some of our customers prefer that a flat foot or anything with a single fastener not drive the hole in the part it is mounted to. Instead they prefer that the part be located by a hard-coded hole. They find it easier if a change needs to be made, to change the dimensions locating the hole than it is changing how the part is defined in the assembly. For example, should this Jergens Flat Foot be located by the hole in the gold block? 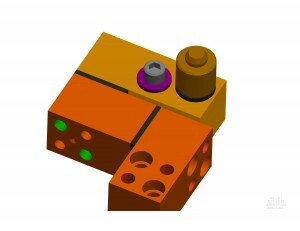 Or should the Flat Foot be located in the assembly and the mounting hole be “driven” into the gold block? 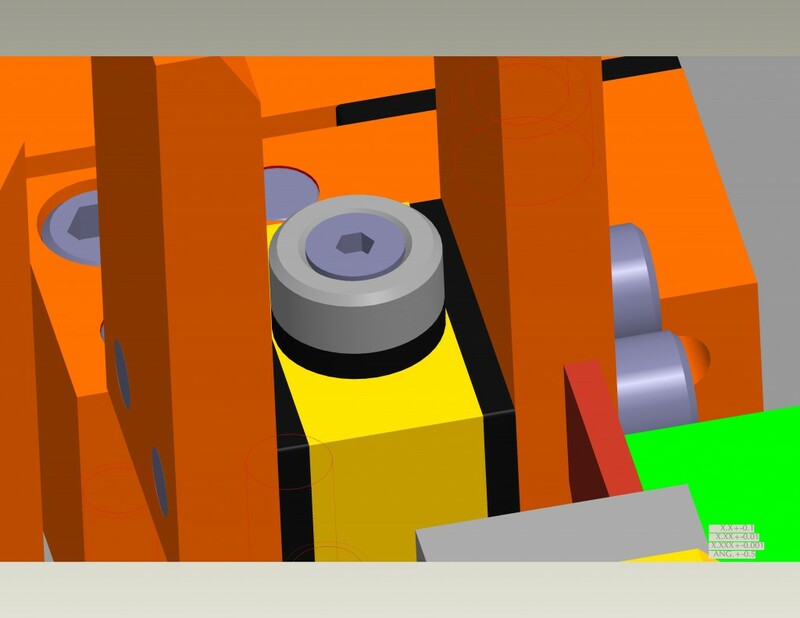 Since I am a proponent of beginning with the parts that touch the product when designing, I would put the flat foot in first, complete my design, and drive the hole in the gold RAPid Block. Then, if I am working for a customer that prefers the flat foot be located by the hole, I would un-drive the hole, re-order the parts in the model tree, and re-define the flat foot according to the customer’s desires. So tell me, does your company have a standard on whether to drive a hole from a single fastener part? If so, what is the standard? Do you know the reasoning behind the standard? I would appreciate learning what you think and what your company likes. Remember! Sign up for Education and Updates on the Rentapen website in April 2012 and receive a free Dowel Hole Guide for your desk top! I am excited about our new Free 3D CAD Models ordering service on Rentapen’s web site. I know I promised to talk more about the simple weld fixture (weld jig), this week, however I am delaying that because this is (I think) so COOL!! Our line of tooling components are now even easier to use. I invite you to play with this new 3d model downloading service. These files are Free! Since we are still discovering kinks, be sure to let us know if you find any problems. The videos I have for you today are about how to use this service. But there is so much more to learn. These videos aren’t polished, but you will get the idea. I know I go on and on about shims at times. I am a big advocate for shimming in weld fixtures. With so many variables involved in how much heat will be created during welding and therefore, how much distorting will occur on the product being welded, shims and shim packs are essential. They help the production group set up the fixture before full production begins. So that when the weld jig or fixture goes into full production it is putting out a product that works. 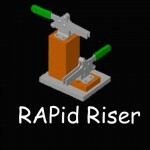 In this next video I show you how to download a file for a RAPid Block(TM) and a RAPid Riser(TM). And in THIS video, our team member, Kory, tells you how to get your Pro/E parameters into your STEP file. I hope you have fun trying out the new 3d models and seeing how you can use them. I’d love to see what you come up with! Didn’t you like playing with legos?? Now that we have a Diamond Pin that is only touching the part on the top and the bottom of the pin, we need to make the contact points of the pin remain in the same up and down orientation. Thanks for joining me as we learn together. I hope you are having as much fun learning as I am! Next week we will talk about how this sub assembly is shimmed and mounted. In machine design there are fundamental rules to follow when locating fasteners. I remember taking drafting classes but I was taught the basics of holes and hole locating only after I started working for Rentapen many years ago. Mr. Iyer commented on the blog last time that I didn’t talk about construction holes for locating the angled cut on the v-block. He is right! So this video talks construction holes. I just want to add that in the video I put in .313″ construction hole. Looking back at it, a .25″ would have been better for this small part. Also the video today talks about a major rule of thumb for locating mounting holes. Mr. Iyer’s comment talked about using a plane that goes from the construction hole to the dowel hole that was zero/zero in the other surface. If this helps, where should I locate the other zero that is normal to that one. Also at the original surface dowel? Remember, nothing is written in stone here. So if you know a better way or your company does it differently, share that with us in the comment section below! Are there other rules of thumb you can share? A reader of this blog, Marvin Davis, has shared with us some links to other free education. It doesn’t appear that any of them are on machine design, but some are on computers and math and so might be of interest to you. I am sharing the list below. But before you leave us to surf and learn, be sure to sign up for Rentapen news and updates on the right side of this page. Then you will be notified of the next Weld Fixture Design 101 blog.